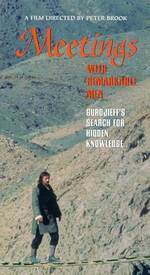 Have you heard the name Gurdjieff and wondered what he and his work were all about? In the film we follow along the path Gurdjieff took growing into manhood and ever more intensely into his quest for the Truth. Overall, I find this video belonging to my husband uplifting every time I view it, which is probably 4 times a year. The music and scenery filmed in the Middle East are just beautiful. They lend to the feeling of mystery and enchantment, that the search for knowing 'what' is behind the sounds and scenes in the unseen planes of existence must entail. At the beginning we witness the portrayal of harmonic singing - high overtones and low notes from the same voice concurrently. That has to be heard to be believed and in the film we see the singer doing just that. Apparently the overtone notes are from high in the throat or nasal cavities above the vocal chords - truly remarkable. After many scenes on unexplained phenomena and guidance in meditation leading into Gurdjieff's young adulthood, the film culminates with the very grand 'movements' which have grown to be his legacy to us today in movement and dance meditation. I have enjoyed many forms of movement and dance over the years; watching the meditative Gurdjieff movement in the film brings upliftment to my soul that is elsewhere unequaled. Susan Kramer reviews a performance of Gurdjieff meditative movements in Amsterdam, The Netherlands.